Posted on 3, December 2015 by EuropaWire PR Editors | This entry was posted in Business, Construction, Education, United Kingdom and tagged Calderdale College, GRAHAM Construction. Bookmark the permalink. 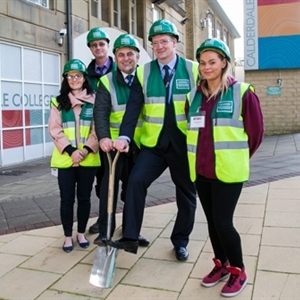 £9m refurbishment project for Calderdale College. Hillsborough, England, 3-12-2015 — /EuropaWire/ — Graham Calderdale College in West Yorkshire has appointed GRAHAM Construction as the main contractor on its multi-million pound Unlocking Potential Project. The £9m scheme will see GRAHAM Construction undertake the refurbishment of three floors of the college’s Percival Whitley Centre to create state-of-the-art learning facilities and a Learning Resource Centre (LRC). Gary Hughes, GRAHAM regional director for the North of England, said: “This contract demonstrates our continuing growth and reflects our strong reputation for outstanding works within the education sector. It also emphasises the benefits of the value we place on a collaborative approach and working partnerships with clients and local authorities. The Unlocking Potential Project will become GRAHAM Construction’s second major project in Halifax in two years as it continues to work on the £23m restoration and transformation of Piece Hall, which is due to reopen in summer 2016. Image features L to R: Elizabeth Curley, Programme Manager for the Skills Capital Projects (the LEP), Simon Green, Project Manager, GRAHAM, Nick Williamson-Corbett, Business Development Manager, GRAHAM, John Rees, Principal & Chief Executive, Emma Maclachlan, student and President of the Students’ Union.